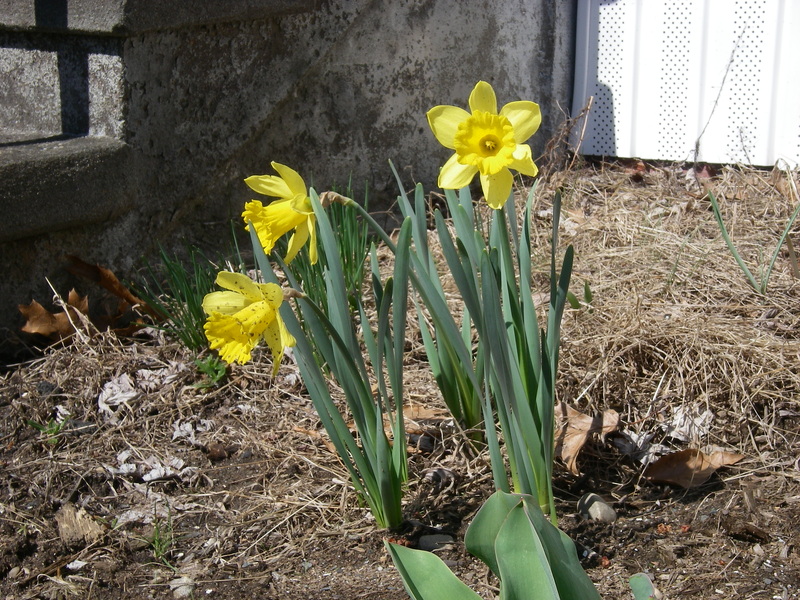 The good news around here is that the first daffodils have started to open. Crocuses have come and mostly gone, and little bits of green are showing up here and there. Then last night it snowed, with a hard freeze coming tonight. Good thing the daffodils are adapted to that sort of thing! By the end of the week it should be getting more reasonable again, up toward 60 during the day. Last week, when it was nice, we took the cover off the boat. That was satisfying! And the snow melted away in the sun this morning, so it’s all working out just fine. It seems time for a bit of a report. Boat tinkering has been continuing through the winter, but I had the idea that it would make sense to write about the more significant projects after they were completed and could be described fully. Of course they proceed in fits and starts, waiting for weather, or parts, or the appropriate moment in the paint shop, or their intermittent turns in the list, often involving waiting for something else to be done ahead that will make it all work out well. Progress happens, but it seems like it’s always sometime around the actual launch when they each come to their conclusion and get checked off as really done. That seems like a long time to wait for a report! Complicating matters further, I’m back in the land of laryngitis. This interferes with writing (speech recognition on the computer) as well as with all the other ways that talking comes in handy. So for the most part I’m saving up voice for the most crucial details. But we’ve been taking pictures of projects along the way, and I’ve been thinking that it would be fun to share some of those, with minimal explanation. Pictures being worth so many words, and all! Happy Spring, to all in the northern hemisphere – after a seriously cold and seemingly interminable winter, those of us in the northeast US sure have earned it! And elsewhere too, I’m sure. In the southern hemisphere, I hope you’ve been having a lovely summer! The Junk rig looks great! Are you ever going to have fun with that. Pretty! Intricate work, too. 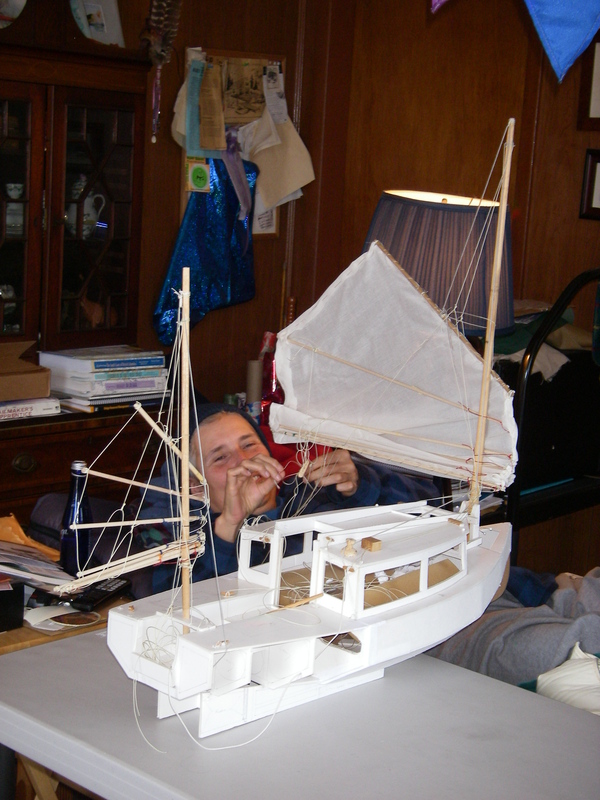 It would be fun having a model of my boat to show off when the garage is closed for the winter. That rig has a lot of strings to pull! (untangle?) How do you think this will be better than the Layden roller-reefed lug you sailed last? Hey thanks – and it’s true, a model is one of the best antidotes for winter. The one-word answer for the change is “reefing.” Specifically, in difficult, higher wind conditions (never mind in the dark). I think my adaptation of the Layden lug was less than perfect – reefing is fine in easy to moderate conditions, but not so fine, including when already partially reefed, at 15 to 20 knots or more. Doable, but not easy, and prone to uneven rolling, resulting in poor sail shape and strains on the sail, often requiring letting out and doing over. Again, this is probably my fault – I expect that it’s a lot smoother on an actual Paradox. But it has given me pause, and there was one time when I did not put in more reefing turns because I was downright scared to try. Junk rigs, on the other hand, are especially famous for easy reefing. I like that idea. 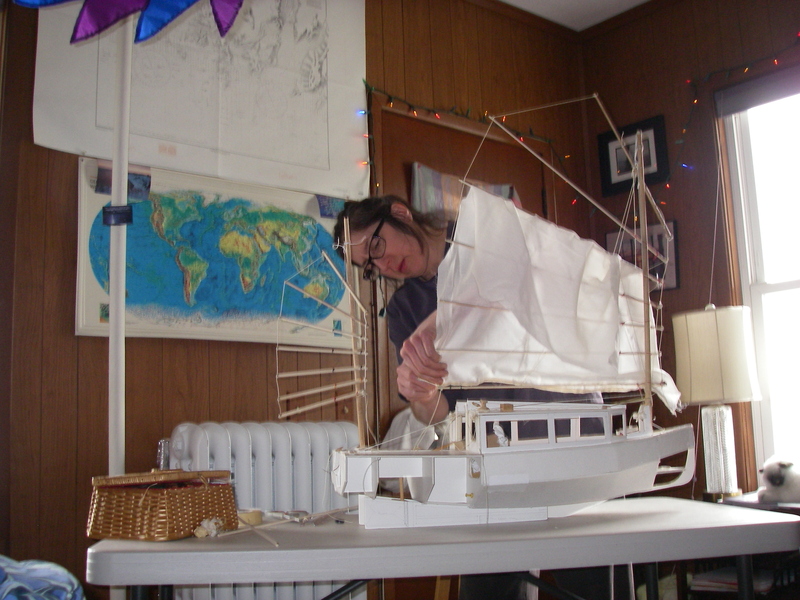 Anyway, the other bonus is more sail area on a short mast – if I change back to the 19 foot mast, as designed (and as in the model) that junk mainsail will have 175 ft.². The original gaff mainsail design is 149 ft.², and the Paradox sail is 99. Not that a small sail stops you from sailing a long way! But it’ll be nice to have more in those light winds. 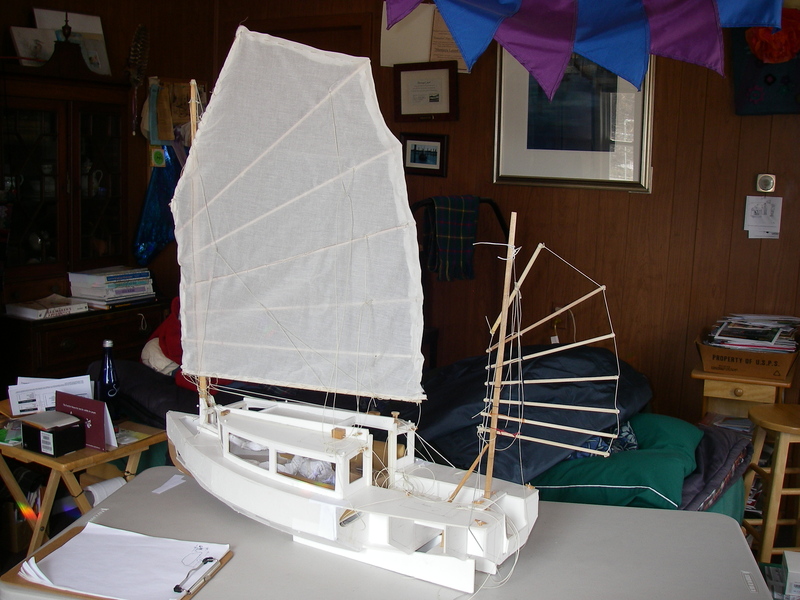 On the short mast (16 ft), this sail should work with the bottom panel reefed, bringing the sail area close to the original design – plans are in the works for the taller mast. Have you started to break out the boats for spring? ?